Wesley commenced working with CSPC in June 2016 after relocating to Leeds from Australia. He Graduated with a Bachelor of Physiotherapy degree at University of Queensland (Australia) in 1999 and has over 16 years experience working in private practice physiotherapy both in Australia and the UK. 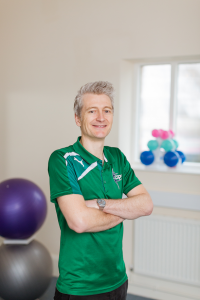 He has a passion for musculoskeletal physiotherapy and loves using hands on and exercise rehabilitation skills to optimise recovery and squeeze every last bit of improvement out of his patients. He has a special interest in treating shoulder and groin injuries. He has worked alongside a Melbourne Neurosurgeon rehabilitating clients with co-existing shoulder complaints after cervical spinal (neck) surgery. In his previous role he enjoyed treating a Junior Australian beach volleyball champion, a masters level Australian female power lifting champion, Australian rules football players and runners, as well as many people with complex and chronic complaints. Wesley completed a foundation acupuncture course in the UK in 2008 and uses acupuncture and dry needling in his treatment plans when needed. He recently updated his skills in treatment of shoulder injuries with Melbourne shoulder specialist physiotherapist Lyn Watson. He has also updated his skills in management of neck injuries with world renowned physiotherapist Gwen Jull. Other post graduate training includes ball based exercise rehabilitation with Joanna Elphinston, MET management of low back and Sacroiliac Joint injuries, management of chronic pain and trigger point release. Aside from working in the private practice setting Wesley has also worked in onsite occupational health clinics, working with Stirling police and Ayrshire council building services in Scotland. Wesley is enthusiastic about commuter cycling and also enjoys trampoline wrestling with his 2 young kids.